Until today, the Japanese have continued to be interested in Shinran. Numerous books have been written about his life, and many scholars have put forward new theories about him. Shinran’s theory of Buddhism came from deep insight and brought about innovation in the Buddhist world. He challenged traditional Buddhism by entering into marriage. Until the Meiji era, apart from variances in Buddhist doctrine, the main difference that set Shinran’s Jodo Shinshu apart from other Buddhist schools was that Jodo Shinshu officially accepted the marriage of priests. Shinran had been born into the Hino family, part of the aristocratic elite in Kyoto, during the end of the Heian Period. His family held a low rank at the Heian Court. It was a period of change from the aristocratic Heian era to the samurai (warrior) Kamakura era. His mother died when he was young, and it is said that his father and four brothers all renounced the world to become monks; some scholars say that he was orphaned at an early age. Like many famous Japanese Buddhists at the time, including Honen, Dogen, and Nichiren, Shinran had been a monk of the Tendai School of Buddhism, based on the Chinese Tiantai tradition. The eminent monk Saicho (Dengyo Daishi) had established the Tendai School at Mt. Hiei. For twenty years Hanen (Shinran) practiced the most severe ascetic life, but in spite of all his effort, he could not find the assurance of salvation. Looking down from the mountain on the Japanese political situation, the monks observed the decline of the aristocratic class and many wars among the samurai (warriors). Emperor Antoku (who was half Taira clan himself) made a national call to arms to the Minamoto clan all over Japan, to rebel against the Taira clan. The people felt, pessimistically, that this was mappo (the Last Days). During the days of mappo, it was believed that chaos would prevail and the people would be unable to attain enlightenment through the word of Sakyamuni Buddha. At 29 years of age, in 1201, Shinran came down from Mt. Hiei. He despaired of ever finding salvation, and he was disgusted by the corrupt and degraded lifestyle of the Buddhist monks on Mt. Hiei. He confined himself to the Rokkaku-do (Hexagonal Temple) in Kyoto and meditated for one hundred days, seeking the answer to his quest for salvation. According to legend, the Rokkaku-do (Hexagonal Temple) had been erected by Prince Shotoku and dedicated to Guze Kannon ((Kuan Yin, 觀音; Guān Yīn) is the bodhisattva of compassion venerated by East Asian Buddhists, usually as a female.). Early in the morning, ninety-five days after Shinran entered the temple, Prince Shotoku appeared to him in a dream and told him to go to the monk Honen. Shinran met Honen and became his disciple. Honen was the founder of the Jodo-shu (Pure Land School). Honen’s theory of Buddhism was that Nembutsu (recitation of the name of Amida Buddha) was the one practice necessary for salvation. Five years after becoming a disciple of Honen, Shinran was finally allowed to copy Honen’s Senchaku hongan nembutsu-shu (“Collection on the Choice of the Nembutsu of the Original Vow”), and drew a portrait of Honen. Shinran’s attitude was that even if he was deceived into doing nembutsu by Honen and went to hell, he would never regret it. Together, Honen, Shinran and other disciples of Honen spread a new doctrine, based on a singular faith in Amida Buddha, through the streets of Kyoto. In 1207, while the ex-Emperor Gotoba was absent from his court, two of his ladies-in-waiting attended a Nembutsu service conducted by Honen’s disciples, and were moved to become nuns. The ex-Emperor Gotoba was very angry. The established Buddhist sects, based in Kofuku Temple at Nara and Enryaku Temple on Mt. Hiei, took advantage of this incident to persecute Honen’s Jodo School. Finally Honen and several of his main disciples were defrocked and exiled, and two other disciples were beheaded. Honen was exiled to Shikoku Island and Shinran to Echigo Province on the coast of the Sea of Japan. After five years Honen and his disciples were forgiven. Shinran, however, had married and stayed in Echigo Province. Shinran married Eshinni, in violation of the Buddhist precept of celibacy for the priesthood. Some scholars say the government and the established Buddhist groups exiled Shinran, not because he was involved with the incident of the ladies-in-waiting, but because of his marriage or because Shinran condoned the marriage of monks. For unknown reasons, Shinran and his family left Echigo Province and traveled to the Kanto region in east central Japan (now north of Tokyo). Some scholars say that his wife’s father had a domain or fief there, and some scholars’ opinion is that, in the local temple libraries, there were some sutras, like Tipitaka, which Shinran wished to study and write about. Shinran’s biography “Denne,” written by Kakunyo (Shinran’s great-grandchild) in 1295, attributed a strong evangelistic motivation to his move to the Kanto region. Shinran spread the theory of Nembutsu to the ordinary people in Kanto region from 1212 to around 1235 or 1236, and established a substantial following in several provinces. His ministry was very successful. He lived not only as a missionary but also as an academic. In 1224 he started to write the Kyogyoshinsho. After twenty years he left the Kanto region for Kyoto. In Kyoto he completed the six volumes of the Kyogyoshinsho, but he encountered many difficulties there. After Honen’s death, Shinran’s fellow believers were under constant oppression and Shinran’s wife, Eshinni, returned to Echigo with their children. Shinran had to live in the homes of his friends and disciples because he had no residence of his own. Even in those miserable circumstances, he wrote several books. In 1256 when Shinran was already more than eighty years old, he was forced to disown his eldest son, Zenran. Zenran studied Shugen-do (修験道, Japanese folk religion, practitioners attempt to gain spiritual power through severe trainings in the mountains) and added magic and sorcery to the Nembutsu of Shinran’s Buddhist theory. Zenran was leading the disciples and followers of the Kanto community in a heresy. Shinran’s closest disciples strongly admonished Zenran, and he laid a complaint before the Kamakura bakufu (government), accusing Shinran’s disciples of propagating a teaching that glorified “evil” deeds. In his old age, Shinran was extremely distressed by this unexpected development. He not only condemned his son but also repented deeply himself. He would often refer to himself as Gutoku ("foolish, bald-headed one”). Nevertheless, confronting the religious hegemony of his time, Shinran worked to re-interpret the Pure Land teaching as the supreme expression and representation of the truth of Buddhism. He re-wrote commentaries by other Buddhists of the time using simple Japanese, rather than Classical Chinese, so that the peasant class could read these texts. He also composed a number of hymns in simple Japanese. Shinran had a number of children, who helped to maintain the new Jodo Shinshu faith. He died in the year 1263, at the age of 90. Honen became convinced that the Pure Land path was the only one suitable for the people during the age of Mappo (the Last Days). Honen summarized his own belief as Senshu Nembutsu (“total concentration to the mindfulness of the Buddha”). Shinran entered the Jodo School of Honen and inherited his "Senshu Nembutsu" theory. 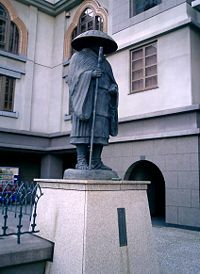 After his exile in Echigo province, Shinran moved to the Kanto region to propagate Buddhist teachings. Here he found many poor farmers who were eager to be saved, but were overwhelmed with the hard work necessary to pay the heavy tenant farmers’ rents. Some had to slaughter animals or fish as a means of livelihood, yet it was a transgression against Buddhism to kill any living being. They had no money to offer and no time to do Nembutsu. If a crop failed, it often meant the annihilation of whole villages. Shinran thought these poor farmers were the most qualified target for the salvation of “Amitabuha” (Amida Buddha). There are three major sutras in Pure Land Buddhism: The Infinite Life Sutra, also known as the Larger Pure Land Sutra, and the Amitabha Sutra (Chinese: 佛說阿彌陀經), also known as the Smaller Pure Land Sutra; and the Contemplation Sutra, or Visualization Sutra. When he arrived in Kanto, Shinran first planned to read these three major sutras one thousand times as a vow and a petition to Amida Buddha. He soon abandoned this vow. Honen had simplified the theory of salvation and advanced the popularization of the Pure Land Buddhism. However, followers of Honen were expect to recite "Nembutsu" sixty thousand times per day and seventy thousand times at their death. Through deep study of the Infinite Life Sutra, Shinran concluded that by saying only one "Nembutsu" with sincere belief in Amida Buddha, even a wrongdoer could be saved. These words later would be widely known as “Akunin Shouki,” which means that wicked persons were the very persons that Amida Buddha wanted to save. This paradoxical theory gave rise to public censure. Honen emphasized the recitation of Nembutsu, and taught that Amida Buddha would then come to take the dying followers to the Pure Land. He insisted that followers had to be reciting Nembutsu at the very end of life. Shinran, however, emphasized that if a person believed for even a single moment, that person already qualified to be born in the Pure Land or the salvation. Shinran’s Pure Land Buddhism was named Jodo Shinshu; Honen’s was named Jodo Shu. Shinshu means “True Pure Land School.” Shinran distinguished Jodo Shinshu from other forms of Buddhism by stressing the distinction between tariki (literally “other-power”; “salvation by the power of Buddha”) and jiriki (“self-power,” “salvation by one’s efforts”). “Other-power” refers to the power of wisdom and compassion made manifest in Amida Buddha’s Vow; “self-power” refers to reliance on a person’s own accomplishment of deeds, practices and disciplines. Shinran conceived the Other-power to be the authentic Buddhist path. The distinction between Other-power and Self-power was not easily understood even by the followers of Pure Land Buddhism. Shinran lamented that they were eager to be born into the Pure Land through their own efforts. For example, they sought salvation by moral and ethical conduct, Nembutsu recitations, and donations. Shinran rejected the idea of salvation based upon ritual actions that seemed comparable to business transactions. For Shinran, one could not calculate and expect to receive merit according to the amount of effort made. Shinran stressed that people needed to rely completely on the compassion of Amida Buddha for salvation, and presented the idea of shinjin (“true entrusting in the compassion of Amida Buddha”). In Kyoto, Shinran completed the six volumes of the Kyogyoshinsho. A book about Shinran’s Buddhist theory, Tannisho, has been popular among the general public until the present day. It is thought that Tannisho was written by his disciple, Yuien, based on a speech given by Shinran during the incident involving the heresy of his son Zenran. Kyogyoshinsho was difficult for ordinary people to read because there were so many quotations from many Buddhist sutras. Shinran rarely spoke directly in this book; instead the reader was left to grasp the meaning behind each of the quoted sutras. Several books by Japanese Buddhist founders had been written to explain the legitimacy of their Buddhist theories, but Kyogyoshinsho was a book of self-examination and confession. This was the real voice of Shinran’s soul. Kyogyoshinsho was composed of six volumes. Among them was “Belief,” espousing a unique concept that could not be found in other Buddhist theories. Most Pure Land Buddhists used three major sutras, the Infinite Life Sutra (the "Larger Pure Land Sutra"), the Amitabha Sutra (Chinese: 佛說阿彌陀經, "Smaller Pure Land Sutra"); and the Contemplation Sutra (Visualization Sutra). Shan-tao (善導, Shan-dao)'s favorite was the Contemplation Sutra, or Visualization Sutra. The Amitabha Sutra (Chinese: 佛說阿彌陀經) and the Contemplation Sutra had been the bible of the Pure Land Buddhism in Japan since the time of Genshin. Shinran, however, chose only the Infinite Life Sutra ("Larger Pure Land Sutra"). This was a bold move for the Pure Land Buddhist school. Shinran reaffirmed that of the forty-eight vows (四十八願) in the Larger Sukhāvatīvyūha Sūtra, the eighteenth vow was the most important. Tannisho: A Shin Buddhist classic. Taitetsu Unno trans.. Buddhist Center Press, Honolulu, Hawaii, 1984. Kyôgyôshinshô: On Teaching, Practice, Faith, and Enlightenment, Numata Center for Buddhist Translation & Research, 2003. Kyogyoshinsho, D.T.Suzuki trans. Shinsu Otaniha, Kyoto, 1973.
de Bary, Theodore (ed.). Sources of Japanese Tradition. New York: Columbia University Press, 1958. Bloom, Alfred. Shinran’s Gospel of Pure Grace. Association for Asian Studies, 1965. -------, The life of Shinran Shonin: The journey to self-acceptance. Institute of Buddhist Studies, 1994. Ueda, Yoshifumi and Dennis Hirota. Shinran: An Introduction to His Thought. Kyoto: Hongwanji International Center, 1989. This page was last modified on 14 September 2015, at 16:23.